Aside from the adventures with the allergy clinic, today was also a day for the plants to show off. Mike Kinney of KTVT, our local CBS affiliate, was kind enough to come out from Fort Worth to capture the Triffid Ranch in all of its dubious glory. He has a thing for interesting characters in the Dallas/Fort Worth Metroplex, so the segment should run sometime next week and appear on the Web shortly afterward. Details will follow. Expect quite a few photos in the next few days, as the camera was loaded with wonders and it’s time to share. In the meantime, here’s a little interlude from last March, where Canada’s greatest superhero came to Dallas to autograph duct tape and make Canadian expats and descendants strangely homesick. "If the Sontarans don't find you handsome, they should at least find you handy." The guy on the left is Martin Meier, a very old and very dear friend who manages to keep me out of trouble just by suggesting it. He didn’t have to tell me not to ask about sonic screwdrivers: the look on his face said everything I needed to know. You know, something just occurred to me. 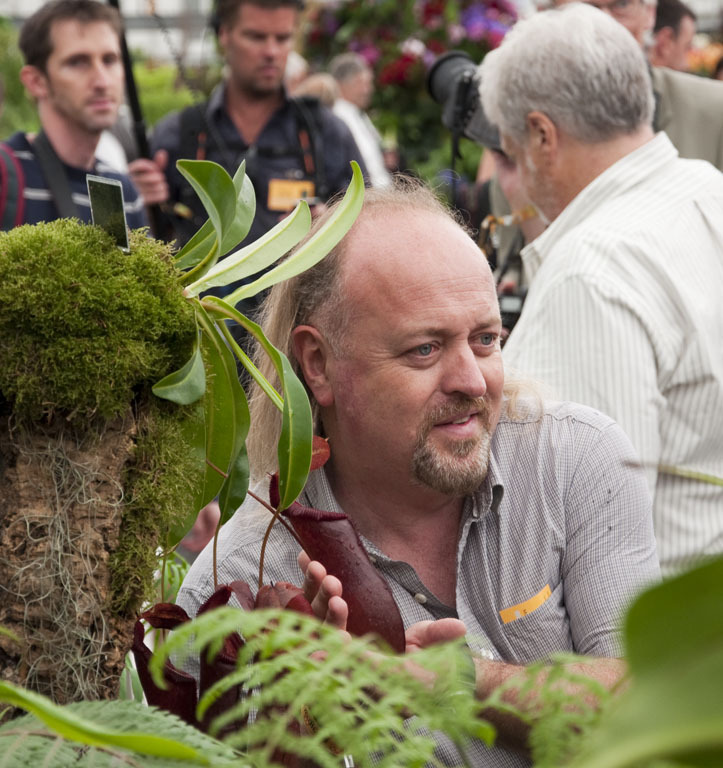 If Bill Bailey can get his very own Nepenthes cultivar, then what’s to stop someone from developing the “Red Green” cultivar of the provincial flower of Newfoundland and Labrador? First, comments about needing pontoons to swim through pools of molten concrete will seem perfectly reasonable, especially by early August. Second, every grocery store, convenience store, and restaurant will be FULL of people, the vast majority of which being native Texans, who will honk “It’s HOT” at anybody passing within a kilometer of their location. They honestly seem surprised, as if July and August in our fair land should be met with blizzards of dry ice snow or rains of liquid methane. (Texas and Saturn’s moon Titan both begin with the letter “T”, so I can understand the confusion.) Be very careful of any grocery store that sells breakfast, because you’ll be surrounded by people with no other jobs during the day than to impersonate a pterosaur rookery. I have to admit that I’m not as bothered by the impromptu weather forecast than I am with the reality that the forecast doesn’t change for nearly five months. Repeating this to anybody who’s already been out in it, especially someone who has to work in it, is a little bit like being a parrot taught nothing but profanities. It’s funny the first 87 times, but then the squawker starts wondering why the recipient is starting to check on the price of barbecue sauce for poultry. The plants love it. I peek out the window in the morning, and I sympathize with Bill Paxton’s character in the Eighties film Near Dark doing the same thing. Anyway, the past few weeks have been particularly bad as far as an inability to breathe at night was concerned, so it was time for an emergency visit to a local asthma and allergy specialist last week. We discovered all sorts of interesting things about my lung capacity and lack thereof when exposed to Dallas’s allergens, but it only got worse today. Today was time for a full allergy test, which for those unfamiliar with this special form of abuse, involves marking up one’s back with a grid, adding pinpricks of individual potential allergens, and then viewing the results. This usually takes about 18 minutes, and I knew the nurse’s screaming at the 8-minute mark couldn’t be good. The prognosis? When exposed to certain constants of Dallas’s ecosystem, I’d best watch out for Kurt Russell and a flamethrower. Most summer weeds such as ragweed and pigweed? Right off the scale. Same with every type of grass pollen common to the area. The molds Alternaria tenuis and Pullularia pullulans? The pinprick tests left me with lumps. I didn’t know if I was growing arms or breasts out of my back. The upshot is that while I joke about how the plants are trying to kill me, it’s a bit closer to reality. Pretty much every outdoor activity in Texas is a potential threat, including my greatest love. Mowing the lawn, tearing apart the compost pile, repotting pitcher plants…I feel like a jeweler who’s discovered he’s allergic to metal. Will this stop me? Nope. A full regimen of allergy shots means having to carry around an Epi-Pen for the first few weeks, but it beats the alternative of getting gills and spending my summers on the bottom of a swimming pool. Besides, I know someone else who chose between allergies and obsessions, and I understand how he feels.